Who says you need to be in Cannes to walk on one? 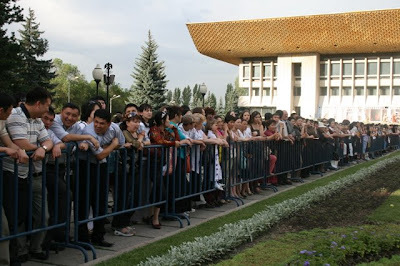 The Kazakh version led us all the way into the Palace of the Republic, for the opening ceremony of the Almaty International Film Festival. Police everywhere. Crowds straining to see. Paparazzi. Everyone went wild when Russian actor, Alexander Mokhov, showed up. The organizers had a simple system: we were each given a tag, and shoved onto the carpet once our number was called. Aki Ra’s Boys was 78. The joke among the not-so-famous crowd was that the higher your number, the more obscure you were. Most of the festival’s overseas guests had come expecting a small opening ceremony, not the big gala we soon realized we had to attend. We must have seemed like an odd lot to the Kazakh spectators – a bunch of scruffy filmmakers, overwhelmed and under-dressed. Still, the locals were ever so gracious: they kept cheering, long after the real stars had left the carpet. Obviously, they had no idea who we were. But as another filmmaker said afterwards – walking down that long platform, it was nice pretending for a moment, that they did.